I dig kitchen gadgets, but I've never been able to get on the trash-compactor wagon - it seems too complicated, too heavy-duty, and not worth the trouble. But the advantages of compacted trash are indeed nice - fewer trips to the outside bin, more space for each toss of more refuse. 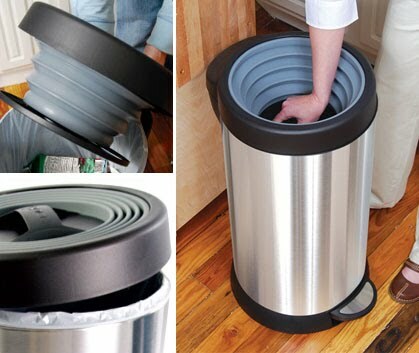 So, I like the Smash Can - a human-powered trash compactor, cleverly designed as an accordion-style pushable lid. It feels clever, and congruous with "green" goals - why waste electricity on... well, waste? The only downside is that the inside compacting surface will surely accumulate some gunk, and cleaning it won't be a blast... But overall, not bad, not bad at all! I would much rather recycle and compost. We went from 4 bags to 1 bag of trash per week just by doing this.